The Houston personal injury lawyers at The Krist Law Firm, P.C. have consistently been recognized by many of the most distinguished legal organizations for their legal talent and exceptional recoveries on behalf of their clients. As experienced injury lawyers, we represent every client with compassion and a fierce determination to deliver results. At The Krist Law Firm, P.C., we are here to walk with you and your loved ones through this difficult time. Since 1968, our attorneys have been here to help and support countless people who suffered catastrophic injuries because of the negligence of others. Our team of attorneys, headed by lead trial lawyer Scott Krist, work tirelessly to maximize compensation for victims of offshore and shipping-related accidents, aerospace and aviation disasters, commercial trucking accidents, defective vehicles and products, chemical plant and oil refinery accidents, and other types of serious personal injuries. Our attorneys have earned a reputation for talented, ethical, and aggressive representation of all types of accident victims. We’ve even helped influence the law in Texas with regard to certain types of injury cases. Our experience has earned us the respect of our peers and honors that include being named among the Best Lawyers in America, Texas Best Lawyers, Super Lawyers, the Top 100 Trial Lawyers by The National Trial Lawyers, and winning prestigious Litigator Awards in 2014 and 2015 from the Lawyers’ Board of Regents. If you’re looking for a law firm that can help you get the compensation you deserve, you’ve come to the right place. Call us today 281-283-8500 to find out how we can help you. Invitation only organization. Inclusion is based on peer nomination and review. Honors the top 1% of all lawyers. Awarded to a small number of plaintiff’s lawyers by peer review. Less than 1% of practicing attorneys are selected. Awarded Top 10 Attorney Award in Texas. Top 1% Attorney in America. “One thing that I’ll tell you about Scott is that he’s going to fight for you. Bottom line. You know, my nickname for Scott is “the Bulldog.” He told me from the very beginning, “I’m to worry about your financial health. You worry about your physical health” — and that’s what he did. The Krist Law Firm, P.C. works hard to obtain the maximum amount of compensation possible in every case. Our attorneys have the experience and resources necessary to fight for every penny you deserve. Click on a case result for more information, including fees and expenses. *The outcome of an individual case depends on a variety of factors unique to that case. Case results do not guarantee or predict a similar result in any similar or future case. People come to us when they want top-notch personal legal representation for their injuries with the highest degree of skill and compassion. Our lawyers have achieved some of the largest published personal injury recoveries in the state of Texas because we fight our hardest for every single person we represent. Every case matters to us because we understand that at the heart of each case there is a human being whose life was altered by circumstances beyond your control. An aerospace accident in which a cabin fire killed all three crew members. A spacecraft explosion shortly after launch resulted in the deaths of all seven crew members. Upon reentering Earth’s atmosphere, a spacecraft disintegrated and killed all seven crew members who were returning home. A serious injury can leave a mark on your life in many ways, not the least of which is financially. Further, we charge no attorney fees unltil we obtain compensation for your case. Take advantage of our No Recovery, No Fee guarantee. When you or your loved one has been the victim of an accident or wrongful death, you should never be left worrying about who will pay for bills or repairs. Your only focus should be on recovery. Maritime environments — whether a vessel, offshore drilling platform, or dockside warehouse — can be uniquely dangerous. Working on water, and the presence of heavy or combustible equipment, can mean that when something goes wrong, the resulting injuries are devastating, even fatal. There also are distinct laws that apply to maritime accidents and injuries that can be different than other types of personal injury cases. That’s why it’s important when you’ve suffered an offshore injury to talk to our team of experienced a Houston maritime lawyers at The Krist Law Firm, P.C. who understand how these cases work and how to build the strongest case for your compensation. A federal law that allows injured seamen to sue a negligent employer for damages. Offshore accident claims may be subject to the Jones Act or other maritime doctrines. A legal doctrine that allows crew members to recover compensation for injuries caused by unseaworthy vessels. Unsafe equipment or tools may support a claim of negligence. A federal law that allows dockside workers to recover compensation for injuries. A legal doctrine that allows injured seamen to recover payment of daily expenses and medical costs until they reach maximum medical improvement. Houston and the surrounding area is a major transportation and shipping hub, as well as being home to oil fields, ample construction activity, and an abundance of heavy industry. The presence of large commercial trucks is part of the fabric of life here. Unfortunately, that means that truck accidents also are a common occurrence. Even though you or a family member may have sustained extensive injuries in a collision with a commercial vehicle, the trucking company or insurance company likely has offered you much less than your claim is actually worth. That’s where our team of skilled Houston truck accident lawyers can help. The Krist Law Firm, P.C. has been successful in helping truck accident victims to obtain the maximum available compensation for injuries and losses. The grief you experience after the loss of a beloved family member can be especially difficult when your loved one’s death was caused by someone else’s negligence. Our Houston wrongful death lawyers at The Krist Law Firm, P.C. can help you obtain monetary compensation to protect your family’s financial future, as well as gain a sense of closure as the person who caused your loss is held accountable by the legal system. If you drive a car, the odds are that you’ll get into a collision at some point. When an accident causes serious injuries, your life can be changed forever. Our Houston car accident lawyers at The Krist Law Firm, P.C. are here to help when you or a family member has suffered significant injuries in an auto collision. When tragedy strikes, and a serious injury has left you and your family reeling from physical pain, emotional trauma, and financial stress, your focus should be on healing and putting the pieces back together. Regardless of how you or a loved one was injured, the attorneys with The Krist Law Firm, P.C. have a broad range of experience in virtually every type of serious injury case. When aviation accidents occur, a complex combination of state and federal laws may apply. You need a Houston aviation accident lawyer at The Krist Law Firm, P.C. who understands the technical and scientific aspects of airplanes, space shuttles, helicopters, and other aircrafts on your side. It is reasonable to expect your safety on someone else’s property. However, when you slip and fall, fall down defective stairs, or are otherwise injured due to a property owner’s negligence, you may sustain serious injuries. Our Houston premises liability lawyers can help you obtain compensation so you can focus on recovery. Because motorcycles provide little protection to riders, accidents involving them can be devastating. When you or a loved one has been injured, you need a Houston motorcycle accident lawyer at The Krist Law Firm, P.C. to make sure insurance companies treat you fairly and you obtain compensation that will cover your losses. When you purchase a product, you expect it to operate safely and as advertised. However, if it has a defect – whether caused by dangerous design, faulty manufacturing, or failed warning – it can cause serious injuries. Our Houston product liability lawyers at The Krist Law Firm, P.C. can help you obtain compensation for your injuries and other losses as a result of a dangerous product. Train and rail workers are constantly exposed to dangerous equipment and hazardous cargo. If you or a loved one is injured due to improperly maintained tracks, mechanical failure, driver inexperience, or another hazard, our Houston train and railroad accident attorneys can help you recover compensation under the Federal Employers’ Liability Act (FELA) or other state or federal laws. An injury at work can be devastating. Your injuries may have been caused by employer negligence or a third party, and you may be facing a significant recovery. Our experienced work accident lawyers at The Krist Law Firm, P.C. can help you file a claim against those who are responsible for your injuries. A serious accident can shatter your life in the blink of an eye. Watch our video to learn how we’re different from other lawyers. Maybe you were working on an offshore drilling rig and a piece of heavy equipment failed, or a fire broke out at a refinery or chemical plant. Maybe you were the victim of a truck driver who was overtired or just not paying attention and collided with your vehicle. Regardless of the type of accident, a catastrophic injury can affect your life for years — perhaps even permanently. You may need extensive — and expensive — medical treatments to heal your body and your mind after a serious accident. Even after you recover, you may suffer a physical limitation or chronic pain that damages your career and your ability to earn money to support yourself or your family. You may feel enormous amounts of stress because of how your injury affects your life, your job, and your relationships. When this happens, you may not know where to turn or what your options are. The Krist Law Firm, P.C. can help. 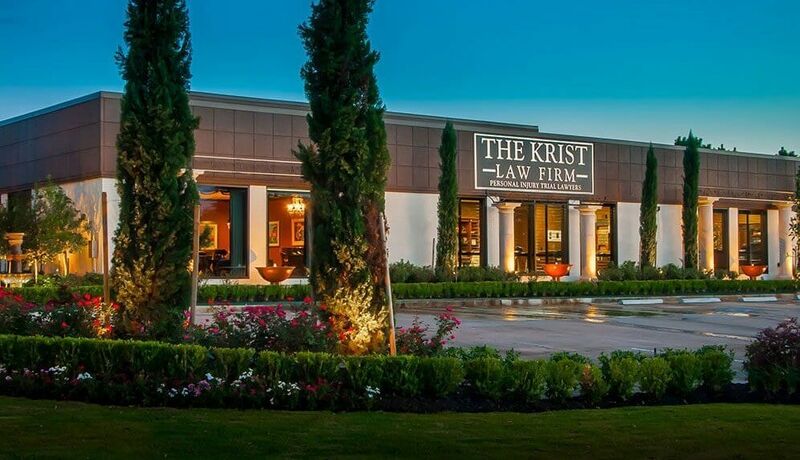 Located in Houston, The Krist Law Firm, P.C. serves many areas in Texas. Whether you’ve been injured in a maritime accident, trucking accident, motor vehicle accident, aviation accident, or a work-related accident, you have a right to be compensated for damages. No matter where you live, we can help. If you’re located in an area not listed here, please don’t hesitate to contact us. We will travel to you if we can help. ©2018 The Krist Law Firm, P.C. | All Rights Reserved. Disclaimer: The Krist Law Firm, P.C. provides legal representation and legal advice to clients throughout the State of Texas. The information presented throughout this site is strictly for informational purposes and is not intended to be construed as legal advice. Additionally, the outcome of an individual case depends on a variety of factors unique to that case. Case results do not guarantee or predict a similar result in any similar or future case. Any imagery found throughout this website is purely for dramatization purposes and does not reflect actual events or current clients. Furthermore, any information we acquire willingly from a client via phone call, contact form, email or other method will remain confidential. For advice specific to your case or if you have further questions, please contact one of our attorneys at 281-283-8500 .